TP5; what do you think?
. The procedures for fonts and bitmaps are a little different and take a few seconds to get used to.
. I imported a TP4 project and it went well.
. You can copy and paste buttons from a TP4 file into your TP5 file. Cool.
. You can't copy and paste pages from a TP4 file into your TP5 file. Less cool.
. When you paste a button from TP4, the button's fonts and bitmaps are lost. Uncool. If my MXT-1001 ships on Thursday as promised, I should have it soon. I'm looking forward to playing with it, and some of the new features. BTW, my crime - what seemed to trigger the crash - was trying to rename a popup page. Heady stuff, I know. It was with much excitement that I installed TPDesign5 this morning - when I saw that they had a fancy new splash for the installer I was expecting great things. Imagine my disappointment then, when I saw the GUI has barely changed! In fairness, it looks like there's a lot of new functionality in the G5 panels that they've had to get in, so I shouldn't expect miracles. The ability to add (Android) apps has great potential, although I can't see any way of adding my own (either from the Play store or custom written ones), so it could be fairly limited. I'm not sure many of our corporate/public sector clients will be exited about Skype (where is Lync?!) or Dropbox. It's also unclear how you interface with these apps from NetLinx (if it's even possible at all) - for example, can you import/insert contacts from elsewhere, or do you have to manually add them on the panel? Without a G5 panel it's difficult to play around with, so lets hope I can get my hands on one soon! I'm leary. I don't have any G5 panels out there yet, so I don't need the extra features. DOes it overwrite the TPD4 install, or will it allow both to run on the same PC? I'm not going to touch it if it's going to force an uninstall or upgrade of TPD4. I don't have the time to mess around with converting all my old projects that are not likely to get a hardware upgrade. @Dave, this will be a concurrent install - it does not replace TPD4. At the moment, you will need TPD4 for your Modero S, Modero X G4, and older panels. @Tom, the IDE was kept the same more to aid in the learning curve. The differences are subtle by design to ensure you are off and running with little effort. You will find the key differences within the drop down menus. Border options and such will be different. You can now do great things like gradient fills (with up to 10 different color levels), and gesture at a button level as opposed to simply anywhere on the page (see the new Events tab on the properties viewer). As start to dig into these differences, there is a lot to like IMO. The app API is still being defined. For now, there is no integration from the netlinx level to the APP level short of launching one via code. Eventually, we expect to allow for data to flow to and from the app and netlinx. This capability would require the API, and then it would need to be included in the APP. At this time, apps will only be available through TPD5 - and not sources like the play store. In the future, I anticipate something akin to an AMX marketplace to house approved apps. My hope is that this would also provide a venue for developers to market their own apps designed for an AMX integrated environment. The restrictions on apps and where they come from is all about ensuring the user experience. As with any heavily customized product, we need to ensure that the app will be compatible with our environment and thus we are limiting what can be installed on the device. As for lync and jabber support, I anticipate support for these in the near future. @chill, I wasn't able to recreate the renaming crash. Do you recall the exact steps? When I attempted to recreate, I imported a file from a prior version of TPD5 and then tried to rename a popup that wasn't currently open, and then again with the popup I was affecting actually open on screen when I tried to rename it. This file was a native TPD5 design. I then tried a converted TPD4>TPD5 file and with the same tests still did not experience a crash. I am running 32bit win7 Pro. I think we will continue to see advancements here. The initial push is to launch a product with a completely rebuilt OS and hardware set. As details like the APP API are released, we can expect additional changes to the tool that will further increase functionality. 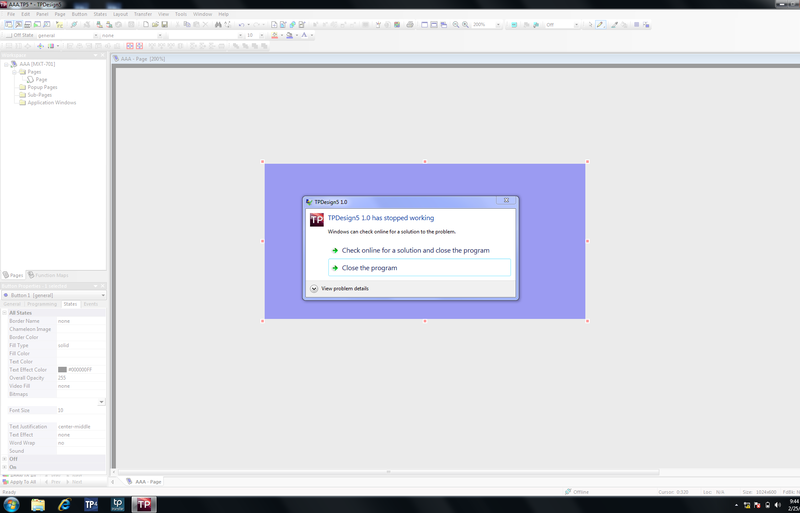 About 5 minutes Into using it for the first time I changed the font and TP5 Crashed. Thanks for the detailed report - I have sent it into the applications team. The New TP Design is a big improvement over TP4. A lot of the new features are very cool. The ability to Copy/Paste multiple pages/pop-ups/subpages at once. This functionality is an obvious one, and it is an improvement that has been requested for almost a decade. AMX Engineering asked on the forums some time ago what improvements could be made to TP4. The ability to Copy/Paste multiple pages/pop-ups/subpages at once. was mentioned & acknowledged multiple times as a great tool to have in future revisions of TPD. Heres a thread started in 2004 where The ability to Copy/Paste multiple pages/pop-ups/subpages at once. was mentioned & acknowledged multiple times also. Over a large project the limitation of copying each page one by one wastes a lot of time. To get the most out of the new extended functionality of TP Design (and have enough time to do so), basic functionality has to be efficient. Quite often we would like an instruction/text/title to be contained to one button. If we need to BOLD one part of the text or have part of it in a different font we then have to make multiple buttons clumsily layered over each other. This feature is also useful for ICON fonts. So you can have a scalable colour coded icon and a button label within the same button. I often find myself trying to adhering to a clients branding document. Without Line Height control I have to use multiple buttons clumsily stacked on top of one another to achieve the desired effect. Spellcheck is available in almost every application we use today yet we don't have it in TP Design. This would be a great feature spelling mistakes and typos can be very hard to track on multiple pages across multiple states throughout multiple touch panel files over a large AV project. Borders look like they are carried over (although there are less of them).They need a scaleable vector graphic based OVERHAUL and an alpha and gradient value just like fills. Needs to be scaleable like Bitmaps. Needs folders and a way of organising pages into folders without making them mutually exclusive. Would be great to be able to group buttons and or have a reference of button layering for more extensive touch panels that involve floor plans. Same problem here. Changing the font crashes TPD5. Same thing with a new file and with a converted file. Uninstalling and reinstalling makes no difference. TP5 crashes for me at the moment by either changing font or simply by pressing F7 to show the channel/port/status overlay. When I bring in my converted TP4 project into TP5 none of the text is displayed on the controls but when I upload it to the MXT-1001 panel all of the text appears on the controls. Secondly, after I upload a TP5 file to the MXT-1001 the panel does not restart ICSP communication with the processor so a reboot of the panel is necessary. I have two MXT-1001's that are behaving the same way. Anyone else have this same problem? A new release is out today that seems to address several of your findings in the release notes. "Range Low" parameter on a Bargrahp has no effect, still go down to 0 ! Pass through buttons no longer work properly either, but I think this is related to the new firmware, not TP5. Has anyone been able to connect to a panel using a [Virtual Netlinx Master] from TP5? The option is not showing up in the connect dialogue for me. G5 panels do not support Virtual NetLinx Master connections. Another thing I have just discovered while building a G5 panel -> there is no longer a concept of 'icons'! It's not in the state properties and there is no 'slots' tab in the resource manager. This is a massive pain and will add significant additional time for developers. It now means that for every button with a custom bitmap background and an icon (a large proportion of the ones in our designs), you'll either have to import every button as a separate bitmap with the icon pre-rendered, or draw an additional button over the top to contain the icon. What's more, if a client decides they want to change an icon, instead of just updating the slot you now need to go through and find every instance of it to swap it out. There also doesn't appear to be a bitmap justification setting any more, meaning that if you want text & image on the same button, you'd better want the image centred (or of course create another button - again, adding more time to the panel development). Tom, you'd really really benefit by reading the documentation "White Paper" Considerations for G5 Panels as referenced repeatedly in these forums. You'd "discover" that this is specifically called out along with the new structure allowing multiple layers of bitmaps within the same button. Your "It now means that..." analysis is completely wrong. This implementation, IMHO, is a much more powerful and flexible way to use multiple images than the kind-of-hacked "slot" arrangement of the past, where contents of "slots" were also actually bitmaps in the regular images. While we use icons a lot, it's messy and limiting. There's a lot of discovery waiting for you in the documentation. Some of it is really ugly, as discussed so far in this and the G5 panel topic. Other parts of it are merely changes in implementation, and some, like this one, are arguably a significant improvement. Change is like purgatory, temporary; lack of change is like hell, everlasting. John - you are correct, I definitely should have read that - my bad. Apologies for being too quick to moan! 1. Property Painter. 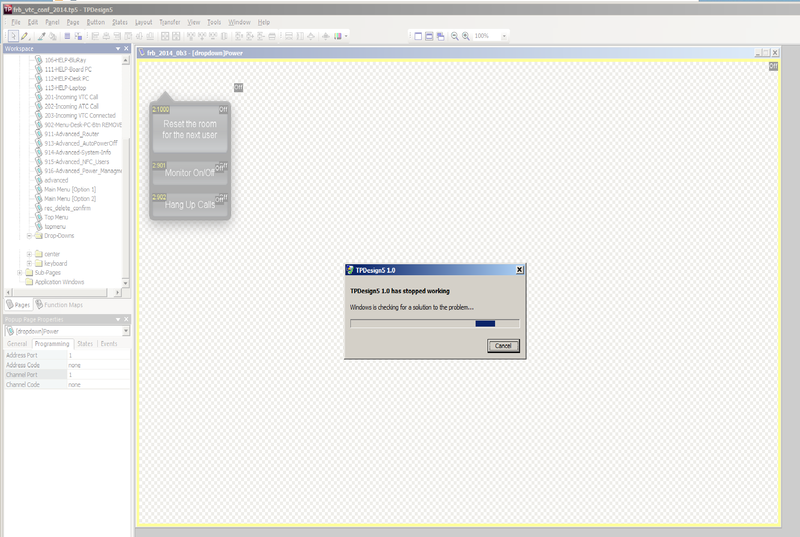 Doesn't want to paint Events, making a tabbed group of popups very time consuming to program. 2. Defaults. Setting default fonts, and other states for buttons and pages seems to mean little. It's all a bit hit-and-miss, meaning far too much time is wasted checking every button's state properties. These are the ones that stand out. Let me know if I've missed something, otherwise it all seems pretty good and a sensible evolution from TP4. Special praise for the new handling of bitmaps, and the new events. Can't wait to get this onto the panel and putting it through it's paces. A suggestion: the color picker always defaults to the RGB color, whereas I believe best practice is to use the color indexes. This is a good example of how the "preferences" section could be improved to provide tailored defaults. This implementation, now that I have to use it, has broken a technique that was effective in G4. Namely, indexed icons were easy to display on a button. Not no more. John, when you talk about 'multiple images' here, it is limited to 5. Our existing program displays over 40 or more icons, depending on source selection and media channel logos. I'm currently looking at how our latest installation can still provide the same functionality across a mix of both G4 and G5 panels. Bottom line, indexed icons are very powerful. Taking that feature away in an 'updated' product has not been appreciated. I've created my own lookup table and substituted the %I command with %P to convert an (old) icon index to an image name. Messy considering I have to esnure all image file name are correct.